I know there are a lot of people out there who want to get into leather work but have no idea where to start. The aim of this thread is to provide a good introduction and starting point for someone who's curious about leather working. Leather working is much easier to get into compared to metal working as it requires a significantly smaller investment in tools. Sure, you can easily spend thousands of dollars on specialty tools and/or machines to work leather, however you only need a few key things to start out with; in fact, you likely have most of them in your tool box right now. There are two sections here: basic leather work and leather carving. 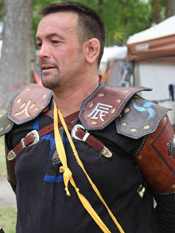 Basic leather work is where the necessities come in, and you can make some great looking and functional armor without ever learning how to tool leather. You need something to cut the leather. I find that a razor knife works well. You'll want to be sure to keep a steady supply of fresh blades on hand, as it's easy to slip and cut either your project or yourself with a dull blade. 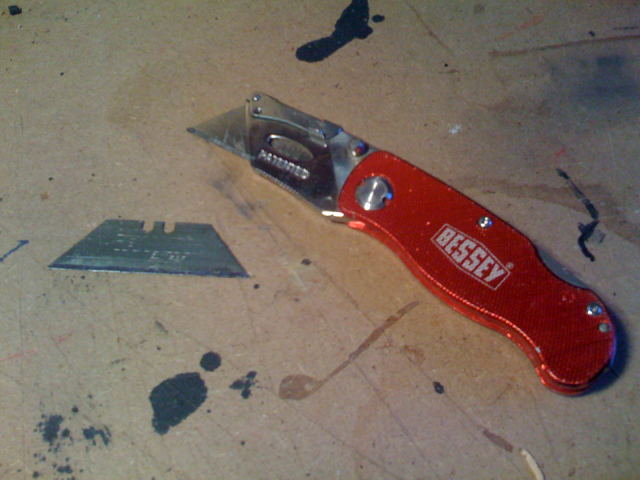 When the blade starts to drag excessively, it's time for a new one. You can get razor knives and blades anywhere that sells hardware. If you have really thick leather, you can also use a scroll saw with a fine-toothed blade for cutting metal. I've also found that for long, straight cuts, a fabric rotary cutter works very well. 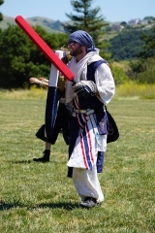 Again, you'll want to be sure to keep an eye on the sharpness of the blade. There are also a number of specialty leather cutting tools like head knives, but they're more of a luxury and beyond the scope of this tutorial. You'll probably also want some kind of straight edge and measuring implement. 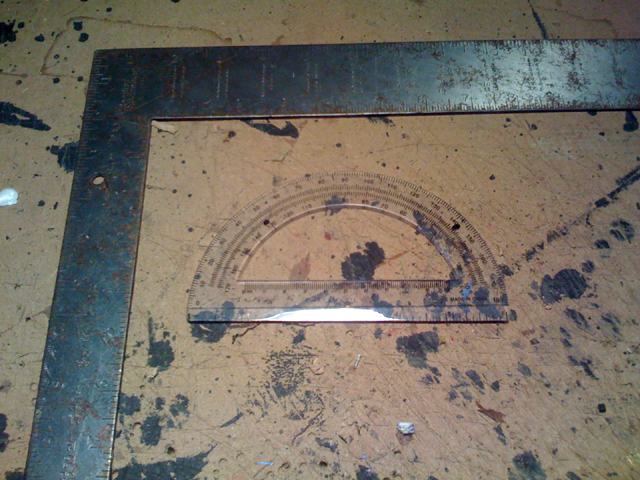 I use a couple here; a cheap clear protractor for smaller work and a large metal framing square. To mark on the leather, I generally use a sharpie marker as most of my pieces are dyed black. If you're going to be dying a piece a lighter color where a black mark might show, it's generally best to mark out the pattern on the flesh (back) side of the leather. You will also need a way to punch holes in the leather regardless of if you're riveting or lacing. Pictured above is a cheap punch set. This will work very well for thinner leathers (generally thinner than armor grade) such as straps or belts and will leave a much nicer hole. These are the rivets you'll want to get for armor. Others can be used, however generally aren't as durable. There are several sizes. For structural use or rivets that will see a lot of stress, I recommend the #9 1" rivets. The #12s can be used for decorative work as they're smaller, but the #9s can be used as well. To set the rivets, a rivet setter is required. It has a hole and a concave area on one end. The hole is used to set the burr (like a washer) securely on the post, and the concave area is used to help flatten out the cut end of the post. A couple smashing implements will be needed. 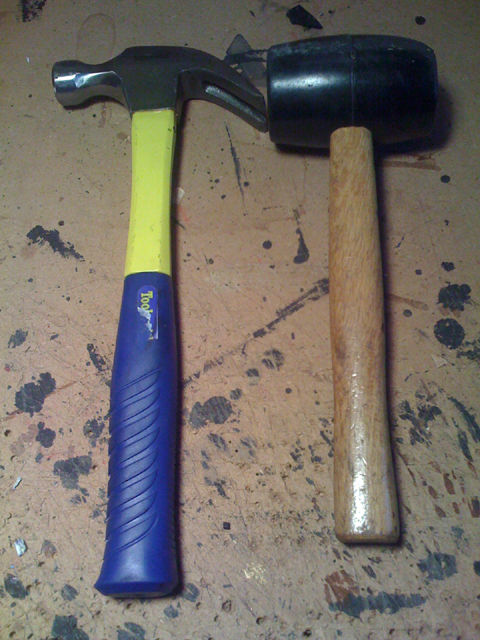 I use a $3 rubber mallet and a $3 claw hammer. The mallet is used on the rivet setter (and all steel tools) to prevent deforming them, and the claw hammer is used on the rivet itself to peen after setting the burr and cutting the post to length. A ballpeen hammer is ideal here, however pretty much any hammer will work. You'll also want a hard surface to do the setting & peening on. 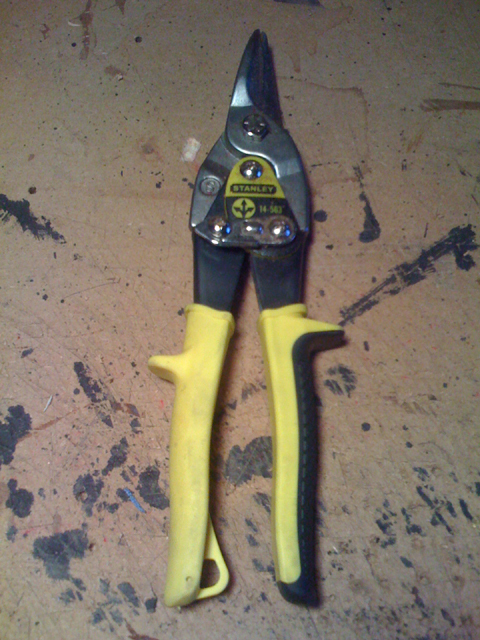 A pair of bolt cutters or snips are needed to trim the rivet posts to the proper length after setting the burr. You're likely going to need some hefty ones. You can again get these at any hardware store. 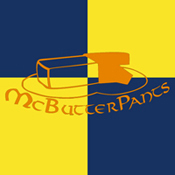 You're also going to want to dye the leather. There are many types available. 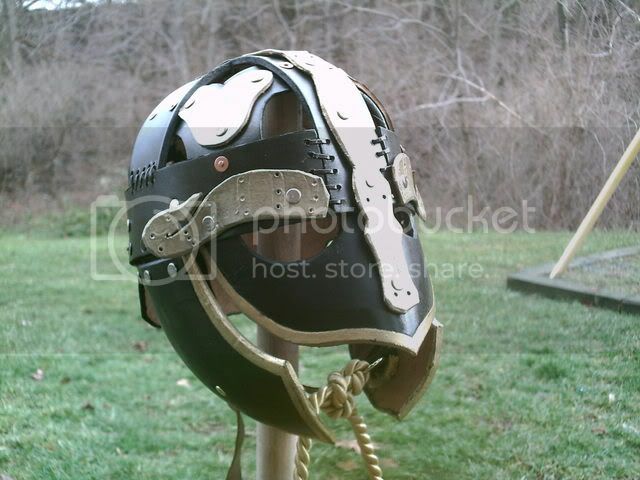 Fiebling's is generally regarded as the best for armoring purposes. You want the alcohol/spirit based dye. The Tandy Eco-Flow shown above can work, however I would really recommend the spirit dye for armor. You can apply it several ways. I generally use disposable foam brushes, but sponges, rags and wool daubers work as well. These tools should get you through the basics of armoring. Coming soon: leather carving tools. If you choose to buy a leather hole punch you can turn it upside down and use it just like a hole punch set.The 10-20 dollars ones are **** however will break very quickly. I have the all steel version (http://www.tandyleatherfactory.com/home/department/Tools/3230-00.aspx?feature=Product_15) it works pretty well either way I use it. I'm sure having the punch set is easier though, but this worth noting. So what do you use to stitch leather together? Like what is seen in this photo by the bridge of the nose and above the ears. Whatever you want, really. Leather cord, hemp, waxed thread, etc. With the thickness of leather we use, it's more of a lacing than stitching. You can buy artificial sinew from most leatherworking suppliers. This allows you to sew leather together edge-to-edge. It looks like they used some kind of plastic lacing in the picture you posted. The sinew is available in a bunch of colors, so you can make the stitching part of your accent. IMO, the sinew looks better than this stuff. It isn't artificial-looking at all and gives you a lot more freedom to do detail work and can be pulled as tight as you want. Plus the holes can be smaller so you see the laces only (and not even those if you pick a sinew color that matches the leather). You can also use a drill with a small drill bit to make the holes in the leather for sewing (double bonus if you have a drill press to make them perfectly perpendicular). that are going to waste, I'm gonna see what I can come up with. He means, "You, sir, are **** stupid. So **** stupid, in fact, that I'm fairly certain you don't know how magnets work, much like your juggalo brethren." Keep in mind that unless your leather is vegetable tanned, you won't have much luck with shaping and hardening. I'm assuming that "fuzzy" leather isn't Vegetable tanned? This guide I'm reading said "hairs" so, I figured that's the case. Okay, well, for all intents and purposes, I'm using (presumably) oil tanned thin/soft/black leather to make a mask to go with my garb. I *do* have vegetable tanned scraps, but I didn't want to use those unless I had to, I had other plans for those. At this point, I just need to figure out if this leather I'm using will run/bleed ink all over my face from sweat. It depends on how it's dyed and tanned, but likely you'll be fine. You won't be able to harden it, however. Works with the #9 rivets mentioned above? So Derian...I need a dark green dye and Fieblings only has a bright green. Is it possible to just mix in some Fiebling's black to get the color I need or is there somewhere other than Tandy that has a larger selection of colors? thorondor, Have you tried immersion dyeing a scrap of leather in the green? it will get surprisingly darker then you think. More layers of dye usually mean a darker result. I'm assuming its better to die leather before stamping it, and etching it? Any advice would be appreciated. Thanks. Not yet. I just went to Tandy & bought all the tools/stamps/etc that I'll need for my project. 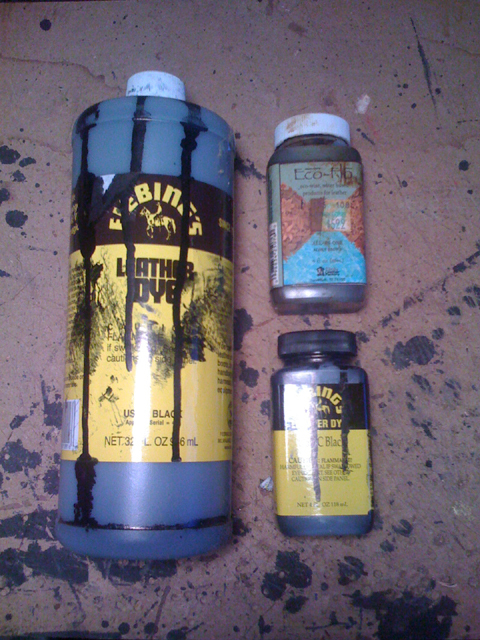 Dyes and leather will be next trip (after I finish the patterns). I didn't want to get the leather & have it sitting around tempting me to cut into it. LOL. I could be mistaken, but I always assumed stamp/etch/etc first, then dye it so the dye gets into the grooves and you aren't stuck with a tan/leather color edge on your nicely dyed piece. You should be doing all your leather carving before dying. It would be a nightmare to try to see what you're doing on dyed leather. Thanks Derian. 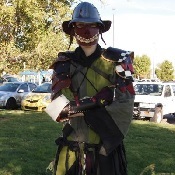 I don't want to botch my leather on my first go on making armor. Much appreciated. Could you use a dremel for hole drilling? 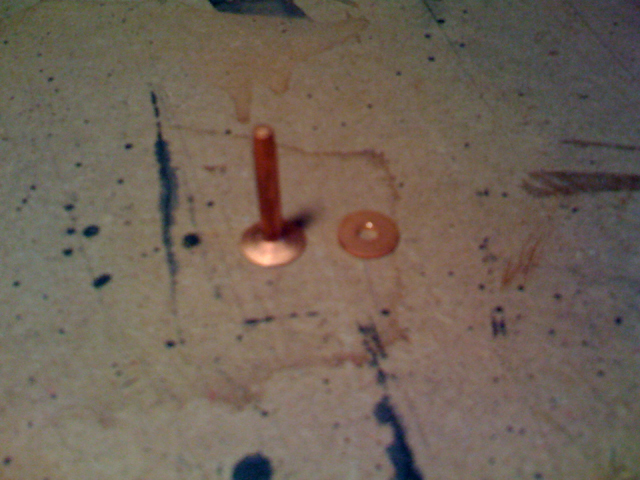 What size bit would you recommend fits the Tandy copper rivets the best? Yes, you can but I found a drill press works 100 times better. 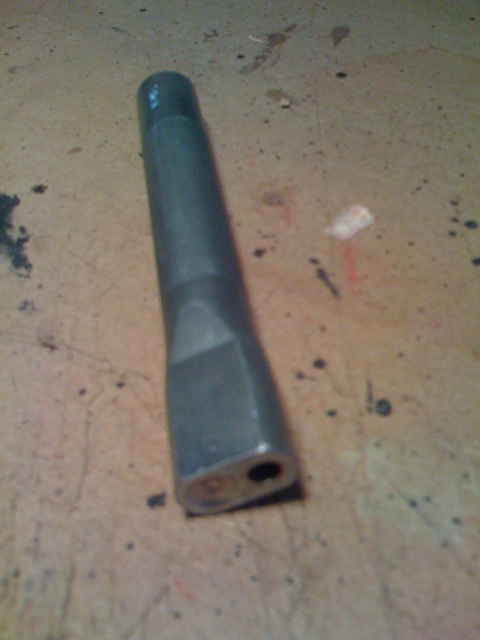 1/8" drill bit for their #12 rivets. I used that combo for any hole that wasn't showing (aka, not straps). For straps I used a hole punch. Is it possible to get custom stamps? I am not thinking of making my own, but I want to get some stamps with Cyrillic letters. I haven't had much luck finding them. I would buy them and then mail them to whomever I commissioned. They say they can make stamps out of any font, and specifically mention Cyrillic. im having a heck of a time getting the snap rivets to stay ... well together. they seem to pull apart. i donno if i am doing it wrong or they just arnt good for much more then decor? what rivets should i use when putting pauldrons together? 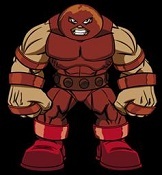 also is there a good place to get free patterns for the leather armor? #9 copper rivets are the standard. 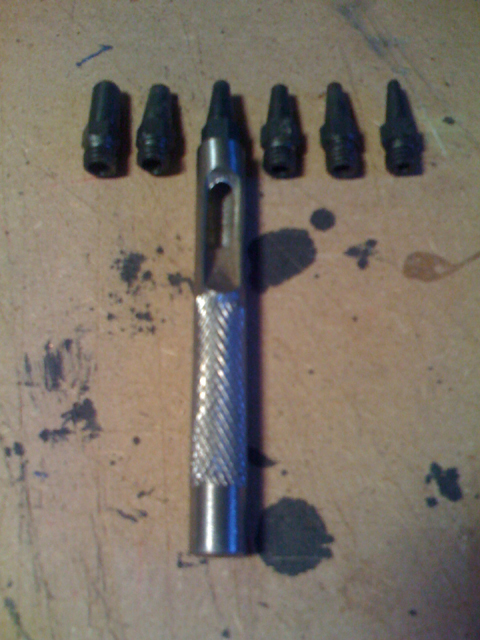 They come in varying lengths for all your various riveting purposes. Think about how thick the leather will be(is it layered?) before purchasing however because you don't want to buy them excessively long or short. Pop/snap rivets are utter **** unless you're making a decorative piece. Anything combat ready should have copper rivets. kool thanks. im teaching myself.. and appreciate all the advice i can get.